The production of aluminum components for the Aerospace industry gives DATRON neo ample opportunity to execute the most diverse milling strategies in the shortest possible time and wows with post-machining-free results. In the latest DATRON neo application example, the milling machine is facing numerous technical challenges during the production of an aluminum component (scaled for demo purposes) for the aerospace industry. Mühltal, 08.06.2017 - The innovative machine systems from DATRON AG show their strengths especially in the machining of non-ferrous metals. Particularly in the field of HSC machining of aluminum components, the German engineering company delivers process-safe industrial milling solutions and thus sets a lasting benchmark for qualitative and economical production. In addition to the proven DATRON milling technologies, the revolutionary 3-axis milling machine DATRON neo with a 2.0 kW spindle for up to 40,000 rpm is suitable for high-quality and cost-efficent machining of aluminum, and thanks to its flexibility fulfills a wide range of requirements for the workpiece. 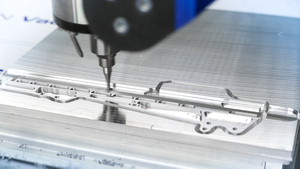 In the latest DATRON neo application example, the milling machine is facing numerous technical challenges during the production of an aluminum component (scaled for demo purposes) for the aerospace industry. The complex component requires a high degree of precision and surface quality. 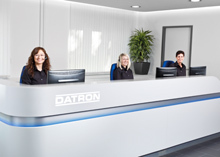 Due to its dynamics and high feed rates, the DATRON manages the most diverse milling strategies in the shortest possible time. In addition to the planning, this includes roughing and finishing of wall and floor surfaces, as well as the milling of M2.5 threads and chamfers. The vacuum clamping technique used is simple to handle and enables the final cutting of the workpiece from the plate material. Thanks to the use of ethanol as a cooling lubricant, the component can be directly processed without purification.